Here is our gallery of man cave ideas for a small room including decor, furniture, materials, finishes, flooring, lighting and entertainment. It is every man’s dream to have their very own space where they can sit down on a sofa, chill out or enjoy a drink. Most of us need a place to unwind or take delight in our hobbies such as playing our favorite musical instrument or spending long hours on video games. With the ever evolving need for a personal space of comfort, man caves became an essential part of the home. What is a man cave? A man cave is a specific area of the house that specifically caters to the needs or hobbies of men. The main reason as to why man caves are often referred to as “male retreats” because it offers an all in one place where one can enjoy some alone time,while taking a break from daily routine or the stresses of everyday life. So essentially, it is also a hangout room for boys or men of all ages. Below we give you some ideas on how to design small man cave spaces along with their common features. Once you have seek out the best location for very own man cave, it’s time to decide on how it is going to look like.Designing a room in the house, in general, can sometimes be a daunting task, but along with a proper guide and planning, the process becomes enjoyable. Type and Function – Just like in any design project, the first and most significant thing that you need to figure out before designing a man cave is to know the purpose of the space. Determining the function of your man cave will help you decide on the design, layout, theme and even the materials and finishes that you will be needing to complete the project. Ask yourself, how do you want to use your man cave? Do you plan on using it for watching movies? Or perhaps for playing video games? Will you be using it solely for entertainment or do you also want to serve drinks or light snacks in it? Will it be a multipurpose man cave or do you just want to stick with a limited number of activities? Consider your main interests and hobbies as it will also lead you to determine the purpose of your man cave. Consequently, the purpose of the man cave will also determine the type of man cave that you will be needing. By this time, you may also have a general idea on the size of the space, so you’ll know the possible options that you can work out with regards to the types. 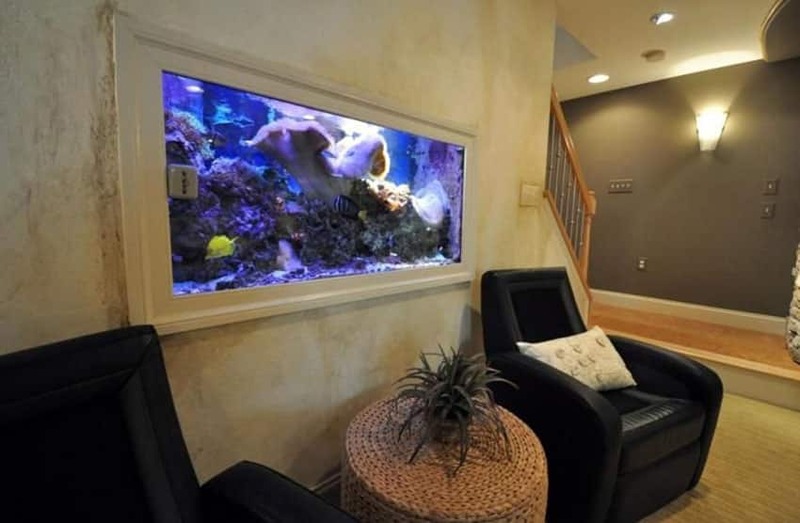 As mentioned, the specific type of man cave is always geared towards the interest of the users. It may either be a bar, a game room, a poker room, home theater or music studio. 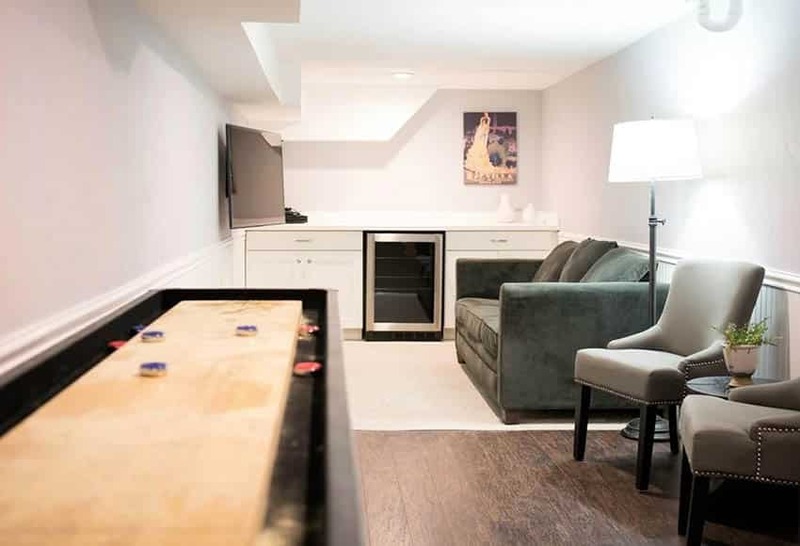 For the obvious reasons, sports enthusiasts tend to go with man caves that include recreational activities like billiards, pool, foosball or darts. Some even go for more traditional games like poker, chess or cards. Musicians, on the other hand, typically go with a studio themed man cave where they can play instruments or even record songs. “Geeks” and gamers opt for game rooms which feature video game consoles or arcade machines. 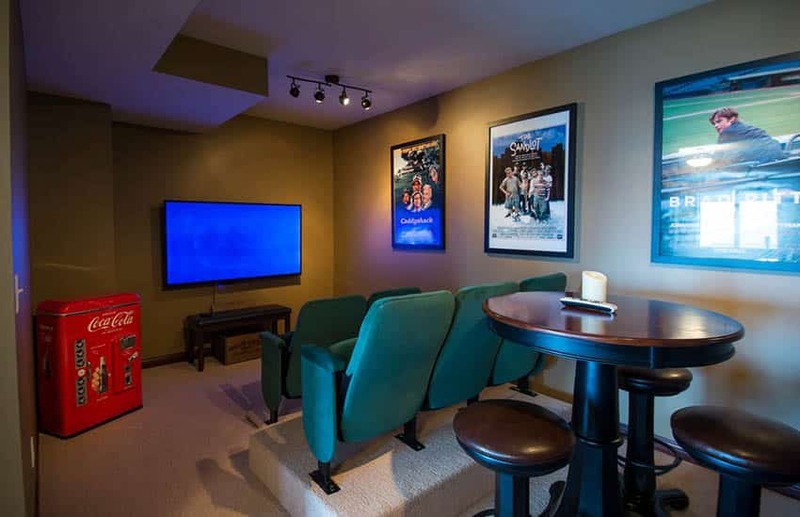 Movie aficionados prefer man caves with home theaters and surround sound systems. Car fanatics typically go for garage type man caves where they can store tools and explore their very own car mechanic shop. While “intellectuals” typically prefer finer things like a library or study. Layout – Once you have figured out the purpose and the type of man cave that you want to achieve, it is now time to decide on the layout of the space. The layout of a space, in general, or a man cave for this case, directly depends on the size and total area of the room. A layout pertains to how furniture pieces are arranged in a space. It involves placement of your seating, cabinetry, tables, recreational systems, etc. This is a critical aspect of design especially if you are dealing with a small man cave. The furniture layout of a small man cave needs to be meticulously planned in order to maximize every single inch of the area. Dealing with layouts may seem technical, but as mentioned it is necessary to attain maximum efficiency for your man cave. It is also ideal to create a simple floor plan of the area or room that you will be using for your man cave. In that way you can explore possible layouts which you can apply to the space. For some small man cave projects, a simple draft of the layout will suffice, as long as the exact measurements of the space are reflected in the diagram. Having a draft of the man cave space will give you a guide in terms of scouting for furniture pieces because you’ll easily know what will fit. You can plan your room layout by using a free interior design layout tool such as Planner5, Sweethome3D or MyVirtualHome. 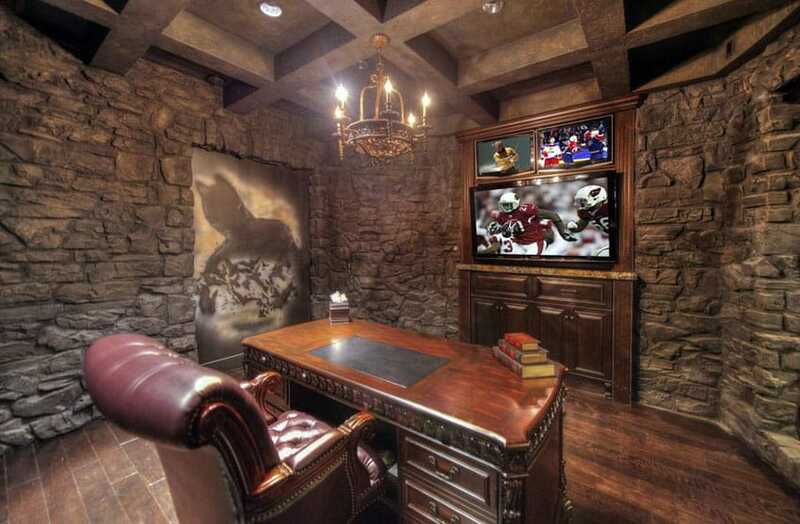 In planning the layout for a small man cave, you can also consider hiring a professional interior designer to help you. Designers can help you take into account every single inch and part of your available space in order to create a fully functional and aesthetically pleasing man cave. They will present a number of possible furniture layouts which you can explore and help you out with sourcing the right furniture, furnishings and materials for the space. Aside from that they also provide proposals in working drawing format which makes construction easier for a contractor, since they have a detailed plan which they can follow. Style and theme – Unlike other areas of the house, a man cave does not necessarily have to conform to the prevailing style of your home. You can design it independently based on its intended purpose. 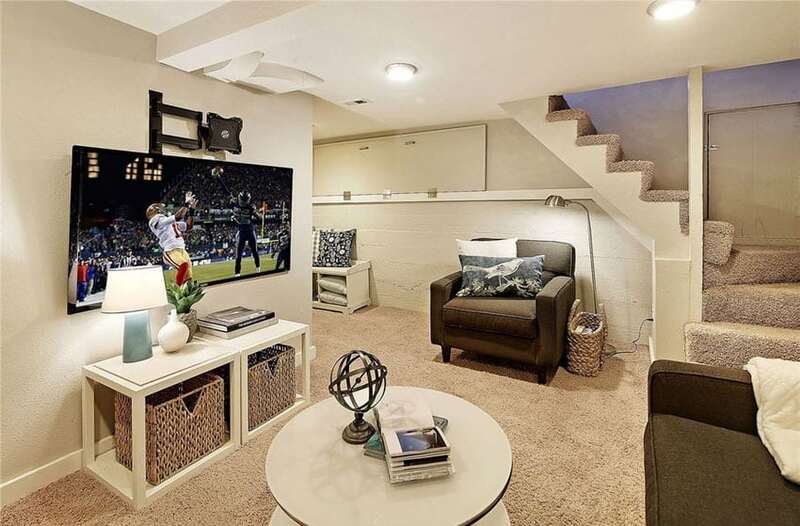 Unlike common areas in the house which are totally exposed, man caves are secluded spots which are typically placed on basements, garages, attics or a spare room in the house. Unless you design your man cave to be part of the living room, then that’s one of the scenarios where you have to at least bend it harmoniously with all the other areas of the house. The style of a man cave pertains to the design inspiration, whether it may be traditional, transitional, contemporary or modern. The theme, on the other hand, pertains to the concept or motif of your man cave. More often than not, this overlaps with the type of man cave that you want to explore. 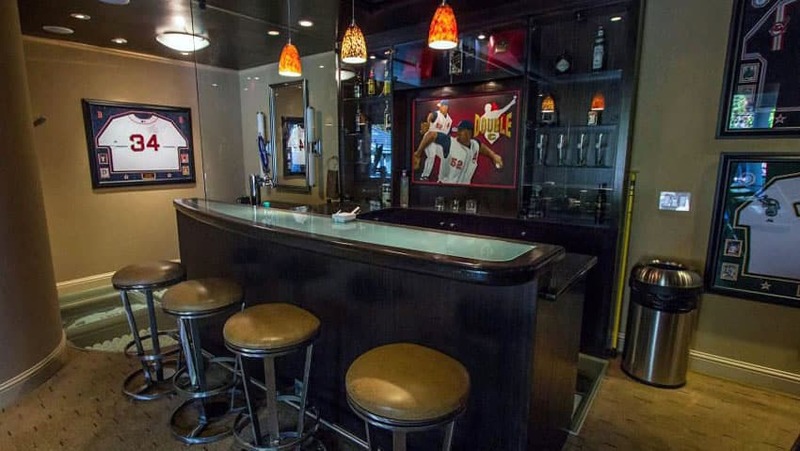 So for example, if you are a sports enthusiast, a good theme for a man cave will be a sports bar, and the perfect design style for it is retro. While if you are love drinking, a possible theme would be a beer tavern with a rustic country style. Once you have found the perfect spot for your man cave, have already decided on the type, theme and style, and have formulated the best layout for the space, it is now time to furnish your man cave. Furniture – The furniture comprises a big part of your man cave design. To make your man cave complete, you need to choose solid furniture pieces which will give you maximum comfort, optimal functionality, superior durability and impressive aesthetic quality. The most common types of furniture which can be found in man caves are seating like couches, arm chairs and recliners. Seating is typically complemented with side tables, while storage typically includes tv cabinets, media centers, shelves, bar cabinets and bookshelves. 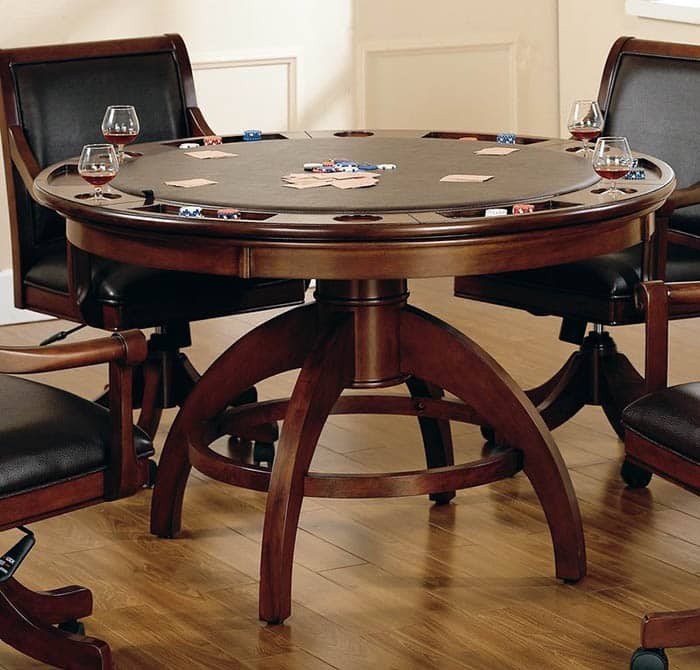 Specialty furniture such as gaming chairs, massage chairs, gaming tables are also popular for more high end designs. When choosing furniture for small man caves, opt for pieces which have multiple purposes as they help you maximize the space. Sizing is also critical as you may need to look for more compact designs as compared to large man caves. When it comes to the material, opt for chairs and sofas that are leather upholstered as they are easy to maintain and durable. In addition to its practical benefits, leather sofas also provide a lot character and promote an upscale look. 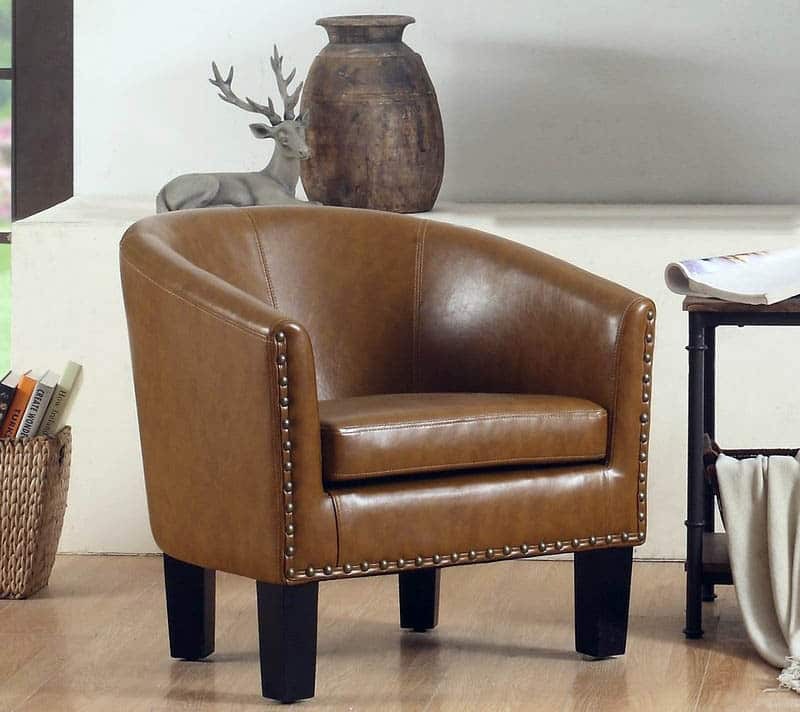 Although proven to be sturdy, leather upholstered furniture has the tendency to get cold during winter and can get sweaty during hot summer seasons. Another alternative is fabric or cloth upholstered seating and they bring in comfort and plenty of cushioning. In addition, cloth upholstered sofas are also resilient can withstand the wear and tear of everyday use. However, if you are going to smoke inside your man cave, choose fabrics which do not retain smells such as wool. When it comes to the color and pattern, opt for medium to dark colors. Dirt and dust do not get easily noticed on dark colored sofas as compared to white and light colors. In addition, dark colored furniture are the perfect complements to light colored walls, which is the color of choice for paint in small man caves. Dark furniture and light colored walls bring in contrast and add depth to the design of a space. Also consider low maintenance furniture or those that can be easily cleaned using a vacuum or a simple cleaner and cloth. Remember, a good amount of time is spent on a man cave, and with such they are more prone to dirt from everyday use. Also take note that the furniture for your small man cave does not always have to be new. If working with a tight budget, consider refurbishing old furniture pieces and give them a new look. Transform old sofas and couches by reupholstering and give cabinets and tables a fresh coat of paint or wood stain. Another practical alternative is to explore flea markets for good deals. Do not be afraid to purchase a vintage wingback chair or a neglected recliner, as no matter how unpleasant their fabric is, you can always find a textile that will work to improve its looks and make it perfectly suited for your man cave’s theme. You can leave your imagination to work when it comes to repurposing old furniture pieces for your man cave. Decor includes accessories and other special features that range from a simple piece of artwork or sculpture, a framed collection of baseball cards or sports jersey, glowing signages, lava lamps, vintage guitars, collectibles and other memorabilia. Most of these things may come from your very own collection, such as your musical instruments, action figures, card collection or posters. 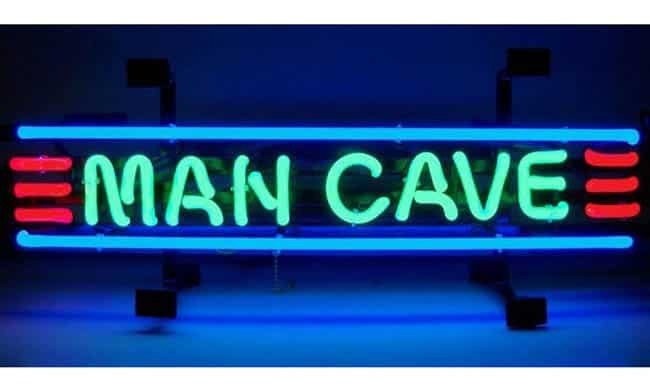 You can also find man cave decor in most antique shops, toy stores or even garage and yard sales. Online suppliers and auction sites also offer unique finds which can make your man cave design more interesting. Ultimately, the type of decor that you will be needing for your man cave will depend on the theme or you choose to go with, whether it may be related to sports, music, movies, cars or gaming. For example, for a music themed man cave decor, you can create a display of your special band posters, showcase rock and roll memorabilia, feature favorite musical instruments, or even highlight your ground shaking sound system. When it comes to choosing the right decor for your man cave, it is important to keep in mind that your decor will help set the tone for home entertaining and at the same time it will affect the overall ambiance and mood of your space. For small man cave spaces, remember to never go overboard with decor as it has the tendency to make your room feel cluttered. Also consider proportion, as you wouldn’t want that lifesize sculpture of your favorite hero taking up a chunk of your precious floor space. Again, your man cave decor does not always have to be new. Consider repurposing old items for new use. You do not have to be a DIY expert to give a room an extra punch. Some of the coolest items for man cave decors can be found in vintage shopping sites, flea markets or even from someone else’s storage. Just make sure to avoid accessories that will deviate from your theme. In addition, stay away from anything that is too “soft” or feminine, such as floral printed throw pillows, scented candles or doilies. 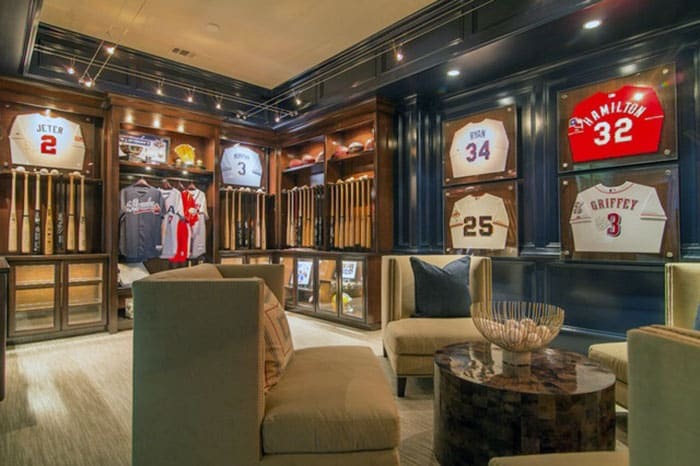 Entertainment– As mentioned, a man cave is generally a place for some personal recreation and relaxation. No matter how great your man cave looks, it will not be an enjoyable experience if there is nothing to do inside. Typically, man caves feature some entertainment and specialty furniture which encourage different activities which can help in destressing. It comes in different forms and will greatly depend on several factors such as (1) the theme of the space which is usually based on a hobby, (2) the type of your man cave, and lastly (3) the size of its space. 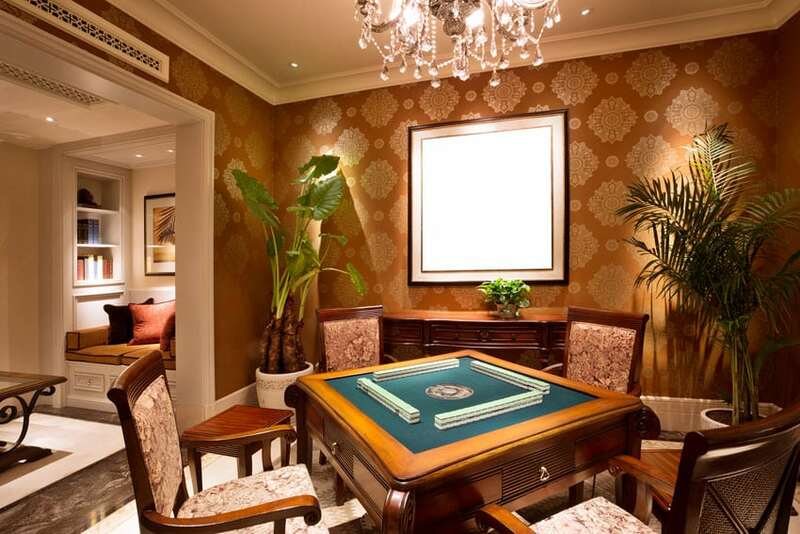 Some common forms of entertainment furniture are media centers, pool tables, massage chairs, arcade games, poker tables, table tennis, air hockey or foosball table. When dealing with small man cave spaces, opt for compact sized entertainment furniture pieces. In addition, stick with one general activity that you like the most and feature that in your space. Most importantly, plan the layout, because no matter how small your space is, if it is smartly planned, you can maximize it and feature all the entertainment you need. Lighting – Most of us often associated man caves with something dim or dark. However, That does not always have to be the case. Just like in any room of the house, lighting is very important in terms of enhancing the ambiance and mood in a man cave. You can choose from a wide array of choices such as ceiling mounted light fixtures, floor lamps, wall lamps, sconces, strip lights,recessed lights and LED. Aside from the usual daylight bulbs and warm white colored lights, you can also explore colored lights such as blue or purple to set the tone in your man cave. Flooring – Flooring is also another key facet of design that needs to be carefully planned for small man caves, because aside from contributing to the overall visual aesthetics, it also affects the way that the space is used in terms of traffic. There are a wide range of flooring materials that are commonly used in man caves and these options include hardwood flooring, laminates, vinyl, ceramic tiles, natural stone, concrete, carpet and cork. Each of these items present their own positive and negative features and provide a different character to a man cave. Wood is a popular flooring finish for man caves because of its proven durability, inherent warmth and natural coziness. It works perfectly with any theme or design style, while at the same time possesses a classic beauty which is hard to notice. However, if you plan on using your man cave as a “garage type” room, then this might not be your best option as it can get scratched. Carpeting is also another popular man cave flooring finish. Aside from being affordable, carpets provide a soft touch to the feet which make them comfortable to walk on or even sit on for long hours. Carpets also work best for man caves with home theater theme as they help in terms of improving the acoustics, soundproofing and noise control of a room. As compared to shiny and hard materials like ceramic tiles, carpets absorb sounds and can help improve acoustical quality. Cork, vinyl and laminates are also other options for flooring, however they are not as durable as the three materials mentioned above. They are all affordable, comes in a wide variety of colors and designs but has different levels of durability and resilience. Cork tile floors come in handy when you’re playing multiple rounds of pool as they are comfortable to step on, does not pose a slip hazard and are firm. When choosing a flooring material for small man caves, it is important to consider the color as it will affect the way the space is perceived – whether it becomes smaller or bigger. Dark colored floors have the tendency to make small spaces look even more limiting, while light colored floors can create an illusion of a larger space. However, dark colored floors can still be used for small man caves as long as you include a balancing factor to tone it down, like a beige colored wall or light colored furniture. Most importantly, always go with a feet friendly flooring. As comfort needs to be a primary goal in designing man caves, make sure that your floors are comfortable to walk on or even sit on. It must also lessen the possibility of slip hazards and be able to withstand the wear and tear of daily use. Materials and finishes – Materials and finishes will help you achieve the overall look you want and the texture and tone of your man cave. This includes the finishes for the walls, floor, ceiling and built in features in the space. Special finishes, on the other hand, include acoustical panels, glazing, accents, etc. When choosing materials for a small man cave, make sure to consider each of their pros and cons as they will not only improve the look of the space but its quality and lifespan as well. Choose finishes that require low maintenance so you do not have to worry about frequent cleaning. 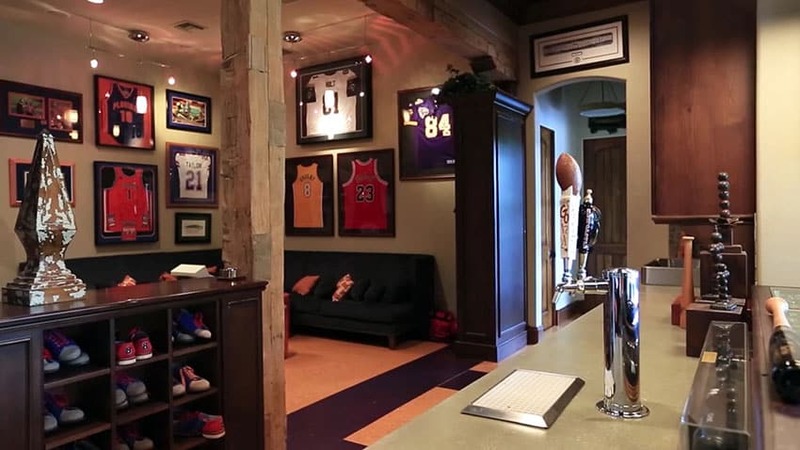 The way your man cave’s style and theme is evoked in a space will depend on how you combine these materials. For example, people who have a love for fine things can go for finishes that give high emphasis on quality materials and sophistication. You can choose phenomenal centerpieces like a mahogany bookshelf, a classic leather chair and some polished surfaces. Color Schemes – Some men may not be too particular about colors schemes, or even the decor of the space, however these make all the difference in terms of visual aesthetics. More often, “masculine colors” such as neutrals like brown, gray, blacks or accents like blue or dark greens are used. These colors offer versatility and works for most man cave styles. In addition, they are an ideal background for common finishes like wood, leather or stone. You can ready more about our tips on colors for small man caves as we go along with this article. Typically, man caves are often situated in a basement, attic, garage or a spare room in the house, however, not everyone gets to have this luxury of space. Man caves do not always have to be grand, it can be small or even a portion of an existing area in the house. As long as the space is dedicated for this specific purpose and it serves as a retreat where you can take a break from everyday activities, then you already have a man cave. These are the possible scenarios that a small man cave usually considers: it can either be a man cave for one, a repurposed man cave or a man cave that is mixed with another space. 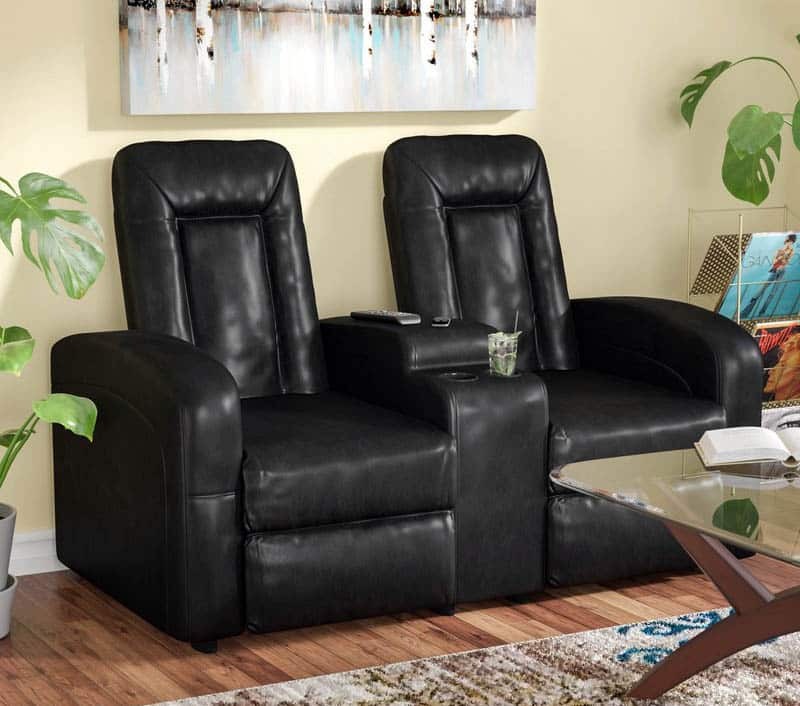 Man Cave for one – Man cave for one are specifically designed for a single user. This is ideal for residences where space is at premium like condominiums, apartments and flats. Man cave for one are traditionally called as a study or an office, where men usually do personal work or read books, but as time passed, it has evolved into becoming a place to unwind, de-stress and entertain oneself. A man cave for one typically features furniture which can accommodate one individual, such as a lazy boy chair, a massage chair or a desk, keeping the furniture few and efficient. For entertainment purposes, man cave for one may include a dartboard, a single arcade game or a TV with a gaming chair. Re-purposed space for Man Cave – Another option to explore when dealing with limited spaces at home is to use an old room for a man cave. When older spaces are emptied, it can be utilized for a new purpose, no matter how small its area may be. It can be a former guest room or neglected spaces in the home like attics or garages. The trick to repurposing is to study the existing site conditions of the space, then take into consideration its features in order to maximize it to its fullest potential. Man Cave mixed with a separate space – A man cave does not always have to be enclosed, sometimes it can be mixed an already existing area of the house like an empty guest bedroom, a living room extension, a patio or garage. Another option is to combine a private office with a library. The main advantage of man caves with combined spaces is that it allows you to cater to two needs simultaneously, or if more preferred it can be used as a man cave space as needed, but the primary purpose of the space is still met. Consider comfort – A man cave is designed to help you unwind after a long tiring day or to simply enjoy some personal relaxation and recreation. With that mind, your primary goal in designing a man cave should always be comfort, regardless of the size of the space. Look for materials, finishes and furniture which will bring comfort and allow you to delight in the experience, especially because you will be spending a considerable amount of time in your man cave. Test out sofas or recliners before buying them and make sure that they are cozy enough to be sat on for hours whether for watching movies or for playing video games. Choose flooring that is feet friendly such as carpet, cork or wood. Keep it light and bright – As a general rule in design, white and light colors can instantly make small rooms appear bigger because they bounce off light better than dark colors. A light color palette can add life to a space without being too heavy on the eyes, while a color scheme that is dominated by crisp white tones can make a man cave feel more airy and bright. Man caves also do not always have to be dark and gloomy. When dealing with small man caves, paint the walls in a light shade of beige, brown, green or blue. Painting a man cave with darker hues can make the space feel to cramped and can make it seem cavernous. Save the dark colors for accents in the space such as the trims, the cornice, baseboards and other accessories and decorative elements. You can also add a pop of color to your light palette to make it more interesting. Less is more – Another key to maximizing a mall man cave space is to keep the design minimal. No matter what the prevailing style of your man cave is, make sure that you prevent it from looking like a storage space with too many furniture or decor. Be careful in choosing your furnishings. Having few tasteful and functional furniture pieces is one way to draw attention in a space, while at the same time catering to the needs of the users. Choose one statement piece of furniture to anchor your space – Anchor the design of your space by choosing one statement piece of furniture which will serve as the focal point in the design. It can be a large piece of sofa or recliner which will also tie the decor of your room together. Along with your large statement furniture piece, bring in two or three pieces of small furniture to complement your design, like an armchair, an ottoman, a side table, end table, coffee table or bookshelf. Choose multipurpose furniture – Due to space limitations, a small man cave will only be able to accommodate a minimal amount of furniture pieces. To make sure that you make the most out of it, choose multipurpose furniture as part of your design. Incorporate sofa beds which can transform from seating into a lounging chair, providing maximum comfort in terms of relaxation or even rest. Include a coffee table with storage compartments where you can stow away small things like game console controllers, remotes, boards game, etc. Extending tables can also be used as a serving place for snacks and drinks, while multipurpose media centers can be used for storage. Ultimately, cut down any unnecessary items from your design and stick with useful furniture pieces. Find the right size of furniture – Choosing the right size of furniture in proportion to the room’s area is critical in terms of creating a well balanced aesthetic. Together with proper scale, the placement of the furniture pieces is key in giving the impression of spaciousness. When designing a small man cave space, make sure to find the right size of furniture and avoid cluttering the space with large pieces of furniture as it can instantly make your room feel smaller that t actually is. It is ideal to take note of the general measurements of your man cave or keep a simple sketch or layout of the space so you have a guide as you shop for furniture. Alternatively, you can also hire a professional Interior Designer as they can guide you in selecting the right furniture and in optimizing your man cave space in an aesthetically pleasing way. 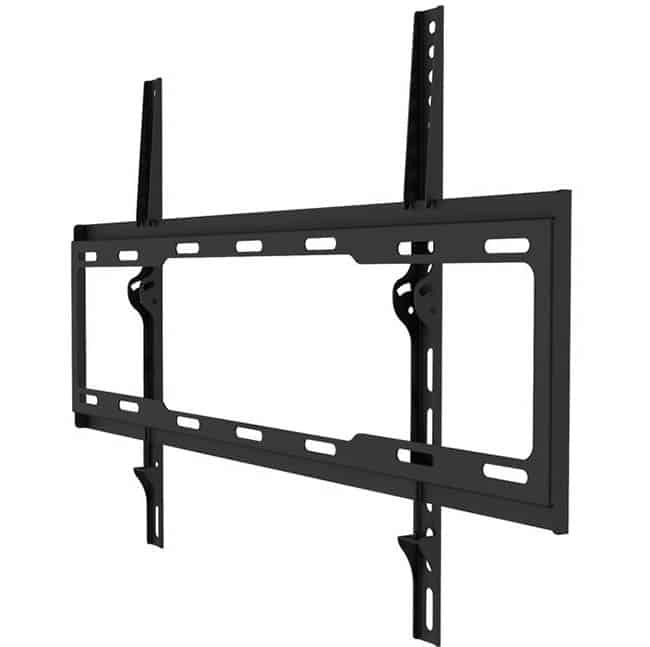 Consider hanging your TV – A good way to save space in small man cave is to get rid of your television cabinet, stand or console, then replace it with a wall mounted bracket for TV. Incorporate a hanging shelf under the wall mounted television where you can put your cable box or video game console. In addition, set up added storage space for housing electronic accessories, headsets and controllers to prevent them from cluttering a space and at the same time keep them from easily accessible when needed. Free up floor space – In connection with the design tip above, opt for hanging shelves, overhead storage units and wall mounted furniture as they help you free up floor space. Instead of housing man cave decor like memorabilia,collectibles, action figures or video game collections in freestanding cabinets, showcase them in hanging shelves and ledges. Do not go overboard with decor – Too much decor can make your man cave feel too cluttered. So instead of overloading your displays with too many items like accessories and memorabilia, avoid overstuffing shelves and choose only your favorites or the best pieces that you want to showcase. Opt for unique decor like artworks, paintings, vintage items and old sculptures as they add class to your man cave and at the same time, serve as great conversation starters. Improve lighting – There has always been a misconception that a man cave must always be dim, but in reality, lighting is an essential part of creating the right mood and ambiance for a man cave. Be sure to add lights such as ceiling mounted fixtures to your man cave to keep it bright. ALternatively, add ambient lighting like blue lights, floor lamps and dimmers if you want to create a dramatic atmosphere for your man cave. Use mirrors to create an illusion of space – Regardless of which room you are dealing with in your house, mirrors work wonders in terms of making small rooms appear bigger. To create an illusion of a bigger space, incorporate mirrors throughout your man cave design. 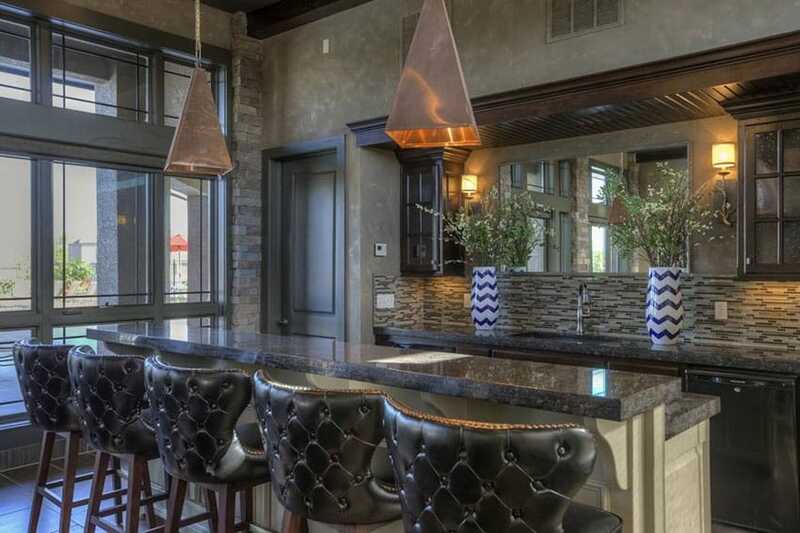 You can either hang a decorative bar mirror or use floor to ceiling mirrors as wall treatments. Mirrored furniture such as coffee tables also contribute to this effect as they reflect more light, making a space feel larger. Placing a mirror opposite a light source also makes rooms look brighter since more light bounces back. Play with lines – Another trusted design trick in making small rooms appear bigger is the use of linear patterns in a spaces. When designing small man caves, do not be afraid to play with patterns. Put emphasis on vertical lines as they create an illusion of a taller wall, while highlight horizontal lines if you want to make a wall appear wider. You can incorporate these patterns through the use of wallpapers as an accent wall finish. Another option is to use wood laminates with horizontal graining patterns for low built in furniture or wood laminates with vertical graining patterns for tall built in furniture. 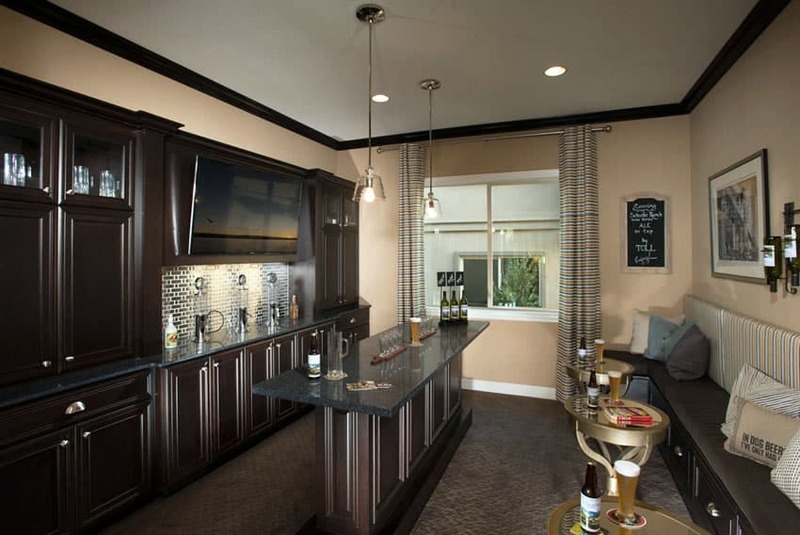 Consider a bar cabinet or a bar cart – Just because the space of your man cave is limited, that does not mean that you can’t incorporate a bar in it. For drinking enthusiasts, there are more ways to enjoy and serve drinks at home without having to build a full bar. 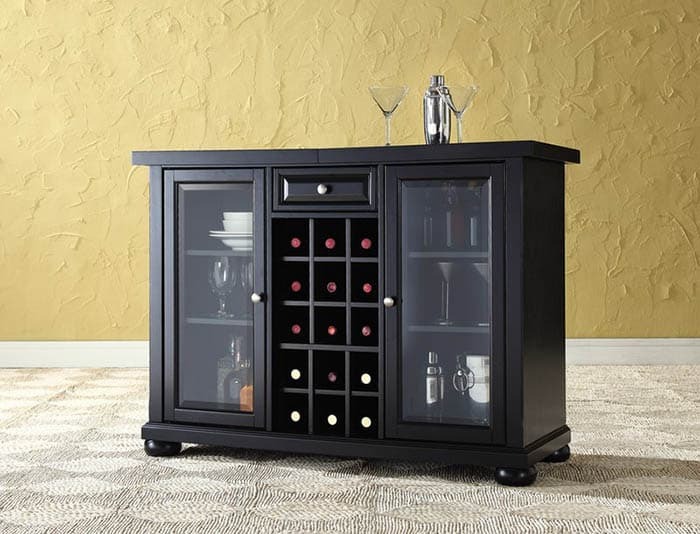 Consider including a bar cabinet where you can stash liquor and other bartending equipment for preparing drinks. You can either incorporate this on a corner of your man cave or have it discreetly built-in on a wall. Alternatively, you can use a bar cart for the same purpose as it provides mobility as maximum accessibility. 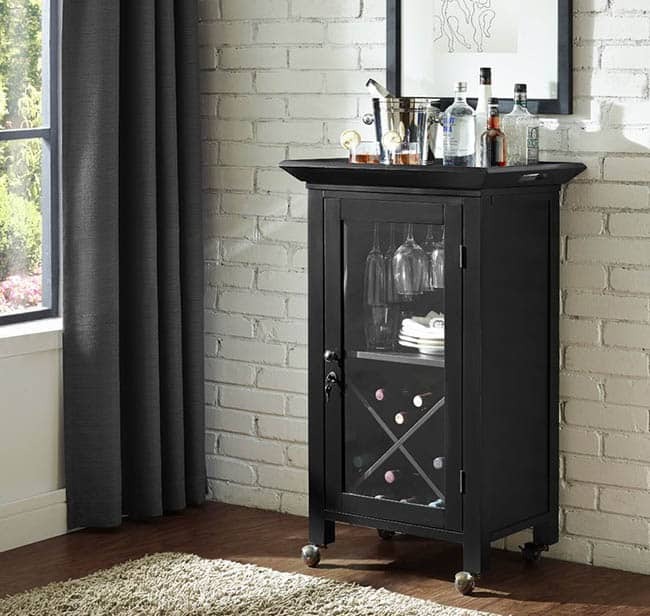 A bar cart can be stowed away even between furniture pieces or in neglected nooks, while at the same time you can pull it out whenever you need it. Add those personal touches – Personalize! 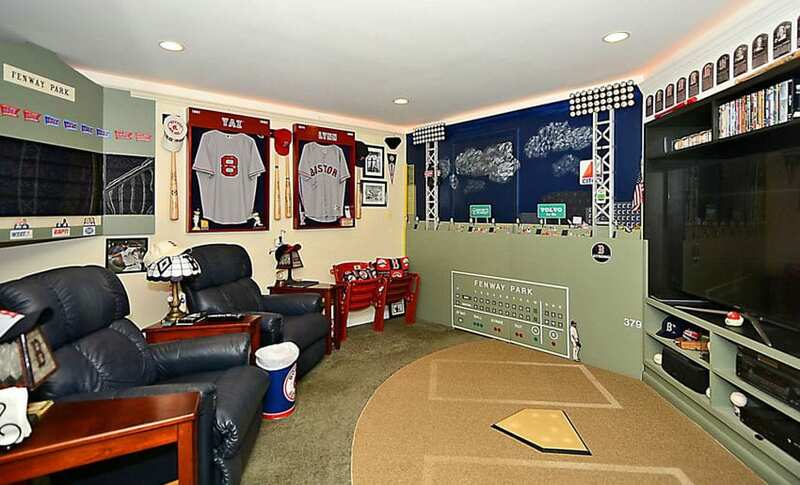 Your man cave is a direct reflection of your hobbies and interests. And a small space should not limit you from creating a man cave that echoes “you”. Make sure to add in a piece of your personality in your decor. Your love for car or racing may be a good inspiration as a theme for your small man cave. Articulate your love for music by turning your small man cave into a small studio. While if you are an intellect, create a small man cave with a “library feel” complete with stained bookshelves, leather upholstered chair and abstract art.